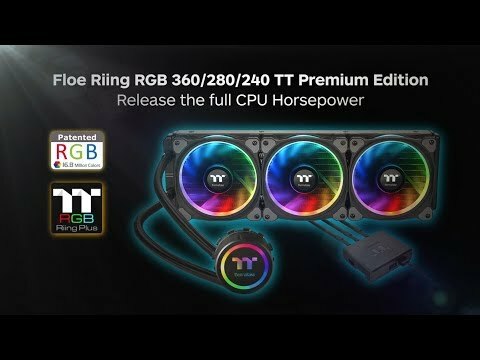 The Floe Riing RGB 240 TT Premium Edition is the world’s first 16.8 million colours liquid CPU cooler with two 120mm Riing Plus RGB fans and a LED waterblock. This cooler series features its extraordinary performance and superior quality. The large surface radiator plus high-performance waterblock and pump guarantees ultimate CPU cooling. Besides, the waterblock and the fans are manufactured with multiple addressable LEDs that can be controlled by the patented TT RGB PLUS Software and AI interactive voice control. Functions within the software also allow users to monitor fan performance and track CPU temperature. Enjoy better cooling performance and greater CPU protection with one simple upgrade! TT RGB PLUS Ecosystem is the intelligent lighting system for PCs that combines the most advanced addressable LED lighting with Thermaltake’s patented TT RGB PLUS Software. TT RGB PLUS ecosystem provides nearly unlimited possibilities for playing with colours, synchronizing lights to games, music, CPU temperatures or other TT RGB PLUS products, including case fans, CPU/VGA waterblocks, AIO CPU coolers, PSUs, LED strips and peripherals. The patented software allows users to change the light modes, colours, speeds, brightness, fan speeds, and even supports AI voice control in iOS and Android devices. Monitor the fan performance, adjust the fan speeds, and customize the lighting effects for Thermaltake RGB PLUS series products with the patented TT RGB PLUS Software and an exclusively designed mobile app. Choose a function from below and scroll down to read the details. Talking to TT RGB PLUS App is an easier, faster way to set lights for your systems. You can ask it to turn the lights on or off, switch lights modes, dim the lights, change light colours, or adjust lights speeds or fan speeds. Choose a video from below to see how it works. Apply one of the present light modes that allow you to switch between different lighting schemes along with three “Colour modes” (RGB, Single and Off) and four “Light Speeds” (Slow, Normal, Fast and Extreme). Copy Colour– Seamlessly transfer lighting effects of the first fan across to other fans. Special designed 240mm large surface radiator not only doubles the cooling surface, but also supports up to 4x120mm fans for additional heat dissipation. Featuring superb cooling performance, the Floe Riing RGB Series provides an easy installation system and a totally maintenance-free operation, requiring only the minimum amount of space in the chassis. Features TT LCS Certified. 2x RGB Riing Fans Included.